MONTPELIER, Vt. – The Vermont Fish & Wildlife Department is holding a series of introductory seminars this spring on a variety of fishing techniques. “With the arrival of spring comes new opportunities to go fishing and to try a new fishing technique or target a new fish species,” said Corey Hart, coordinator of the Let’s Go Fishing program. Introduction to Bullhead Fishing, Friday, April 26, 6:00 to 9:00 p.m., Panton, VT. The clinic will explore different fishing styles to target bullhead, which are found in many of the shallower, muddier lakes, ponds, and rivers of Vermont. Brown bullhead, like other species in the catfish family, are nocturnal bottom feeders, so the clinic will take place in the evening when they are beginning to be active. 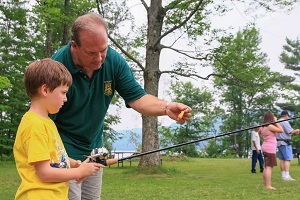 Introduction to Trout Fishing, Saturday, May 4, 9:30 a.m. to 2:00 p.m., Waterbury Public Library, Waterbury, VT. This clinic will teach the basics of fishing for trout using a standard fishing rod known as ‘spin casting gear.’ Participants will learn they don’t need fancy gear to fish for Vermont’s premiere cold-water fish. Introduction to Fishing for Panfish with Artificial Lures, Friday, May 17, 6:00 to 8:30 p.m. Lake Paran, Bennington, VT. Panfish are the smaller fish species that fit in a pan, including pumpkinseed and bluegill sunfish, perch, rock bass, and crappie. They’re easy to catch and tasty to eat! The clinic will focus on catching these species using artificial lures – perfect for people interested in taking the next step from a basic hook and worm! Fish Processing, Wednesday, May, 29, 6:00 to 8:00 p.m., Lake Champlain Maritime Museum, Ferrisburgh, VT. Learn how to catch your own dinner! The program will focus on how to cut up a variety of fish species quickly, easily, and safely, as well as how to safely store just-caught fish to keep it fresh for eating. Veteran anglers may also learn a few tricks to make processing fish easier and more efficient, as well as ways to maximize the amount of meat harvested from each fish. Equipment will be provided, but participants should dress for the weather as the programs will take place outside. All seminars are free, and participants are encouraged to bring their own snacks or meal. Space is limited to the first 30 registrants and seminars fill up quickly, so sign up as early as possible. Pre-registration is required and can be completed at www.vtfishandwildlife.com. Directions to the meeting spot will be given upon registering. Reasonable accommodations for persons with disabilities are available upon request. Please include a description of the accommodation you will need. Individuals making such requests must include their contact information. Please send an e-mail to corey.hart@vermont.gov or call the office staff at 802-828-1000 (voice), 1-800-253-0191 (TTY).